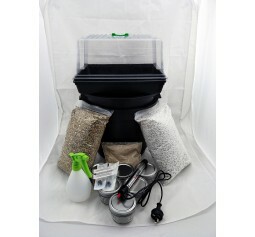 Includes Grow box With water Heaters Birth Box with Spray Bottle and 4Ltrs of Perlite (Please note, Birth box lid may be slightly different as my supplier changes it regularly) 6 wide mouth half pint jars 4ltr vermiculite - optional can change to Sawdust for growing Woodloving Species 500 grams brown rice flour Enough materials to do 2 batches (12 jars) 2x 10ml Syringe and Needles Detailed instructions All you need is your favorite mushroom spores or L/C syringe and some household items. 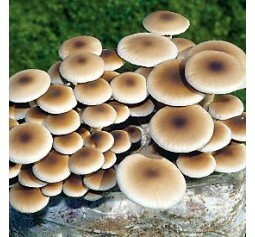 All Upgrades on the large grow kit page are a..
Pleurotus Pulmonarius Oyster Grow Bag Known for it's anti-inflammatory and analgesic effects, the Phoenix oyster is typically used for medicinal purposes as opposed to its culinary counterpart, the Pleurotus OstreatusType: choice edible, medicinal usage and compounds, researchCharacteristics: Light brown coloured fruitbodiesBest Temperature Range: Medium 18-24°C fruiting temperatures ..
Mushrooms Kits Bulk Deal 10x kits of your choice from our range.Grow lots of fresh mushrooms at home, all you need is a simple greenhouse with a humidifier set to 85% - 90% humidity.Grow mushrooms for you and the family at home. 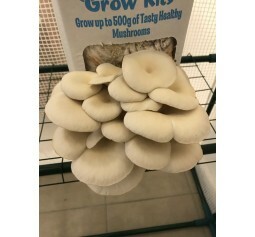 This is a great method if you love mushrooms and want to get a fresher, cheaper product.Please put in the comments what kits you want.eg; 1 White oyster kit, 2 Yellow Oyster kits, 4 Tan oyster kits, 3 shiitake kitsPlease note; if you select more than 4 types we will choose from those, what ones we sendPlease note these kits/culture is sold with our Mushroom ..
Includes Choice of 2 x pre-sterilised Rye grain injection port bags, or 1 bag of King oyster or Swordbelt spawn1 Coco Peat Block4L vermiculite Alcohol SwabsComprehensive instructions All you need are 2-3 Clear plastic storage containers (2 x 25L or 1 x 50L)5 Litres of boiling waterOptional: 30mm spade drill bit, Polyfill and black tub liner..
Agrocybe aegerita Swordbelt Also known as Black Poplar, Chestnut Mushroom, Yanagi-matsutake, Piopparello, Südlicher Schüppling, Characteristics: Large fruitbodies, smooth, yellowish-grey- brown, Temperature Range: Mid: 10-18°C fruiting temperature Very popular for their superb taste Some say it even tastes like bacon!Please note this culture is sold with our Mushroom Spawn and Cultures sale agreement. By purchasing you agree to this agreement ..
Cloned from a wild fruit body of an Australian Hericium found in the Otway National Park Victoria AustraliaID done by University of Tasmania Lions mane are world renowned for their potential health benefits. In particular, their neurological benefitsPlease note these cultures are for personal use onlyPlease note this culture is sold with our Mushroom Spawn and Cultures sale agreement. 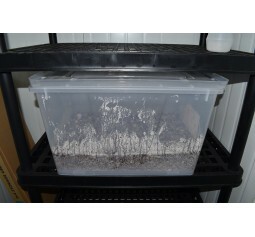 By purchasing you agree to this agreement..
Pleurotus Ulmarius (Elm) Oyster Grow Bag Bright white colour. 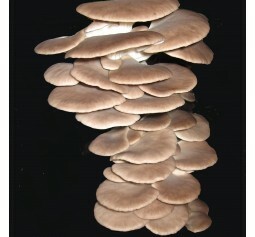 The Ulmarius oyster behaves much like the White Oyster kit except for its superior tasteType: choice edible, medicinal usage and compounds, researchCharacteristics: White coloured fruitbodiesBest Temperature Range: Medium Low 15-23°C fruiting temperature ..
Pleurotus Ostreatus White Oyster Grow Bag Stunning white colour. 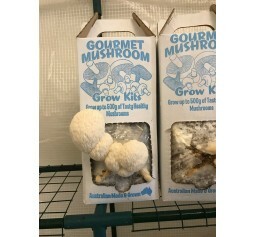 The white oyster is incredibly easy to grow and is a crowd favourite due to how bountiful and easy each flush isType: choice edible, medicinal usage and compounds, researchCharacteristics: White coloured fruitbodiesBest Temperature Range: Medium Low 15-23°C fruiting temperaturePlease note this culture is sold with our Mushroom Spawn and Cultures sale agreement. 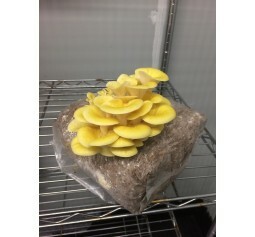 By purchasing you agree to this agreement ..
Pleurotus Citrinopileatus (Yellow Oyster) Grow Bag Vibrant yellow colour. The Yellow oyster kit is fantastic for its stunning colour which is unlike any of our other kits. 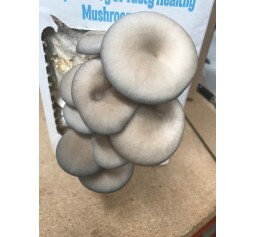 Type: choice edible, medicinal usage and compounds, researchCharacteristics: Yellow coloured fruitbodies and a citrus odourBest Temperature Range: Medium 18-23°C fruiting temperature Please note this culture is sold with our Mushroom Spawn and Cultures sale agreement. 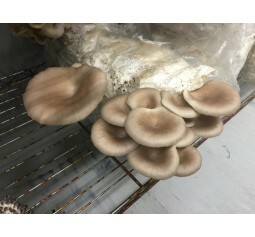 By purchasing you agree to this agreement ..
Pleurotus Pearl Oyster Grow Bag commercial quality Amazing blue colour, size and shape may be slightly different as we supply different stains in warmer and cooler months During winter we supply Type: choice edible, medicinal usage and compounds, research Characteristics: Steel blue coloured fruitbodies especially when young Best Temperature Range: Low 10-21 °C fruiting temperatureDuring summer we supply a warmer strainType: choice edible, medicinal usage and compounds, researchCharacteristics: Steel blue colored fruitbodies especially when youngBest T..
Pleurotus Tan Oyster Grow Bag commercial quality Type: choice edible, medicinal usage and compounds, research Characteristics: Tan coloured fruitbodies Best Temperature Range: 10-26 °C fruiting temperature Uses The oyster mushroom is frequently used in Japanese, Korean and Chinese cookery as a delicacy: it is frequently served on its own, in soups, stuffed, or in stir-fry recipes with soy sauce. 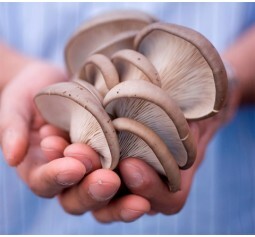 Oyster mushrooms are sometimes made into a sauce, used in Asian cooking, which is similar to oyster sauce. 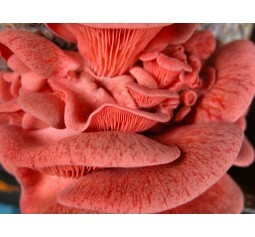 The mushroom's taste has been described as a mild w..
Ganoderma Steyaertanum (Reishi) Grow Bag Deep red colour. The Reishi mushroom is one of the most famous medicinal mushrooms and has been used in traditional Chinese medicine for centuriesThis Australian strain of Reishi has been shown to be one of the most potent strains on the market as well.Type: choice edible, medicinal usage and compounds, researchCharacteristics: Deep yellow and red fruit bodies. 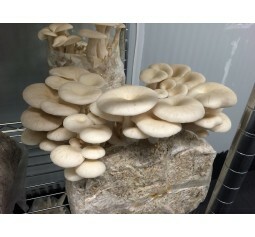 Unpalatable when unprepared but has incredible medicinal properties when prepared correctlyBest Temperature Range: Medium Low 15-23°C fruiting temperaturePlease note these cultures are ..
Pleurotus Djamor Oyster Grow Bag Lucious pink colour. Very aggressive strain and you'll have a hard time getting it to NOT fruit. Type: choice edible, medicinal usage and compounds, researchCharacteristics: Hot Pink coloured fruitbodiesBest Temperature Range: High 23-29°C fruiting temperaturePLEASE NOTE Pink kits need to be used right away, they can not be stored for later usePlease note this culture is sold with our Mushroom Spawn and Cultures sale agreement. 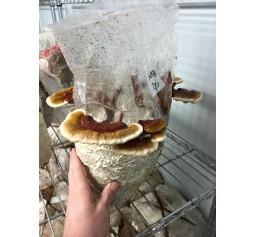 By purchasing you agree to this agreement ..
Shiitake grow bag We supply many commercial farms with this exact type of Shiitake block so you can be sure that you are getting a top quality product Grow Lots of fresh Shiitake mushrooms with this easy kit When your kit is finished, don't throw it away! You can use it for compost in your garden or you can break the log up and use the inoculated sawdust to start your own logs from hardwood logs! 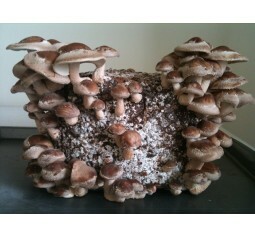 Please note this culture is sold with our Mushroom Spawn and Cultures sale agreement. By purchasing you agree to this agreement ..